The garden strawberry (or simply strawberry; Fragaria × ananassa) is a widely grown hybrid species of the genus Fragaria, collectively known as the strawberries. It is cultivated worldwide for its fruit. The fruit is widely appreciated for its characteristic aroma, bright red color, juicy texture, and sweetness. It is consumed in large quantities, either fresh or in such prepared foods as preserves, fruit juice, pies, ice creams, milkshakes, and chocolates. Artificial strawberry flavorings and aromas are also widely used in many products like lip gloss, candy, hand sanitizers, perfume, and many others. The garden strawberry was first bred in Brittany, France, in the 1750s via a cross of Fragaria virginiana from eastern North America and Fragaria chiloensis, which was brought from Chile by Amédée-François Frézier in 1714. Cultivars of Fragaria × ananassa have replaced, in commercial production, the woodland strawberry (Fragaria vesca), which was the first strawberry species cultivated in the early 17th century. The strawberry is not, from a botanical point of view, a berry. Technically, it is an aggregate accessory fruit, meaning that the fleshy part is derived not from the plant's ovaries but from the receptacle that holds the ovaries. Each apparent "seed" (achene) on the outside of the fruit is actually one of the ovaries of the flower, with a seed inside it. The first garden strawberry was grown in Brittany, France during the late 18th century. Prior to this, wild strawberries and cultivated selections from wild strawberry species were the common source of the fruit. The strawberry fruit was mentioned in ancient Roman literature in reference to its medicinal use. The French began taking the strawberry from the forest to their gardens for harvest in the 14th century. Charles V, France's king from 1364 to 1380, had 1,200 strawberry plants in his royal garden. In the early 15th century western European monks were using the wild strawberry in their illuminated manuscripts. The strawberry is found in Italian, Flemish, and German art, and in English miniatures. [ត្រូវការអំណះអំណាង] The entire strawberry plant was used to treat depressive illnesses. By the 16th century references of cultivation of the strawberry became more common. People began using it for its supposed medicinal properties and botanists began naming the different species. In England the demand for regular strawberry farming had increased by the mid-16th century. The combination of strawberries and cream was created by Thomas Wolsey in the court of King Henry VIII. Instructions for growing and harvesting strawberries showed up in writing in 1578. By the end of the 16th century three European species had been cited: F. vesca, F. moschata, and F. viridis. The garden strawberry was transplanted from the forests and then the plants would be propagated asexually by cutting off the runners. Two subspecies of F. vesca were identified: F. sylvestris alba and F. sylvestris semperflorens. The introduction of F. virginiana from Eastern North America to Europe in the 17th century is an important part of history because this species gave rise to the modern strawberry. The new species gradually spread through the continent and did not become completely appreciated until the end of the 18th century. When a French excursion journeyed to Chile in 1712, it introduced the strawberry plant with female flowers that resulted in the common strawberry that we have today. The Mapuche and Huilliche Indians of Chile cultivated the female strawberry species until 1551 when the Spanish came to conquer the land. In 1765, a European explorer recorded the cultivation of F. chiloensis, the Chilean strawberry. At first introduction to Europe, the plants grew vigorously but produced no fruit. It was discovered in 1766 that the female plants could only be pollinated by plants that produced large fruit: F. moschata, F. virginiana, and F. ananassa. This is when the Europeans became aware that plants had the ability to produce male-only or female-only flowers. As more large-fruit producing plants were cultivated the Chilean strawberry slowly decreased in population in Europe, except for around Brest where the Chilean strawberry thrived. The decline of the Chilean strawberry was caused by F. ananassa. Strawberry cultivars vary widely in size, color, flavor, shape, degree of fertility, season of ripening, liability to disease and constitution of plant. On average, a strawberry has about 200 seeds on its external membrane. Some vary in foliage, and some vary materially in the relative development of their sexual organs. In most cases, the flowers appear hermaphroditic in structure, but function as either male or female. For purposes of commercial production, plants are propagated from runners and, in general, distributed as either bare root plants or plugs. Cultivation follows one of two general models—annual plasticulture, or a perennial system of matted rows or mounds. Greenhouses produce a small amount of strawberries during the off season. Fragaria × ananassa in the UBC Botanical Garden. The bulk of modern commercial production uses the plasticulture system. In this method, raised beds are formed each year, fumigated, and covered with plastic to prevent weed growth and erosion. Plants, usually obtained from northern nurseries, are planted through holes punched in this covering, and irrigation tubing is run underneath. Runners are removed from the plants as they appear, in order to encourage the plants to put most of their energy into fruit development. At the end of the harvest season, the plastic is removed and the plants are plowed into the ground. Because strawberry plants more than a year or two old begin to decline in productivity and fruit quality, this system of replacing the plants each year allows for improved yields and denser plantings. However, because it requires a longer growing season to allow for establishment of the plants each year, and because of the increased costs in terms of forming and covering the mounds and purchasing plants each year, it is not always practical in all areas. The other major method, which uses the same plants from year to year growing in rows or on mounds, is most common in colder climates. It has lower investment costs, and lower overall maintenance requirements. Yields are typically lower than in plasticulture. Another method uses a compost sock. Plants grown in compost socks have been shown to produce significantly higher oxygen radical absorbance capacity (ORAC), flavonoids, anthocyanins, fructose, glucose, sucrose, malic acid, and citric acid than fruit produced in the black plastic mulch or matted row systems. Similar results in an earlier 2003 study conducted by the US Dept of Agriculture, at the Agricultural Research Service, in Beltsville Maryland, confirms how compost plays a role in the bioactive qualities of two strawberry cultivars. Strawberries are often grouped according to their flowering habit. Traditionally, this has consisted of a division between “June-bearing” strawberries, which bear their fruit in the early summer and “ever-bearing” strawberries, which often bear several crops of fruit throughout the season. Research published in 2001 showed that strawberries actually occur in three basic flowering habits: short-day, long-day, and day-neutral. These refer to the day-length sensitivity of the plant and the type of photoperiod that induces flower formation. Day-neutral cultivars produce flowers regardless of the photoperiod. Strawberries may also be propagated by seed, though this is primarily a hobby activity, and is not widely practiced commercially. A few seed-propagated cultivars have been developed for home use, and research into growing from seed commercially is ongoing. Seeds (achenes) are acquired either via commercial seed suppliers, or by collecting and saving them from the fruit. Strawberries can also be grown indoors in strawberry pots. Kashubian strawberry (Truskawka kaszubska or Kaszëbskô malëna) are the first Polish fruit to be given commercial protection under EU law. They are produced in Kartuzy, Kościerzyna and Bytów counties and in the municipalities of Przywidz, Wejherowo, Luzino, Szemud, Linia, Łęczyce and Cewice in Kashubia. Only the following varieties may be sold as kaszëbskô malëna: Senga Sengana, Elsanta, Honeoye that have been graded as Extra or Class I. A diorama created from beeswax by Dr. Henry Brainerd Wright at the Louisiana State Exhibit Museum in Shreveport, Louisiana, depicts strawberry harvesting. Strawberries are particularly grown in the southeastern portion of the state around Hammond. Most strawberry plants are now fed with artificial fertilizers, both before and after harvesting, and often before planting in plasticulture. To maintain top quality, berries are harvested at least every other day. The berries are picked with the caps still attached and with at least half an inch of stem left. Strawberries need to remain on the plant to fully ripen because they do not continue to ripen after being picked. Rotted and overripe berries are removed to minimize insect and disease spreadings. The berries do not get washed until just before consumption. They are covered in a shallow pan and refrigerated when storing. Soil test information and plant analysis results are used to determine fertility practices. Nitrogen fertilizer is needed at the beginning of every planting year. There are normally adequate levels of phosphorus and potash when fields have been fertilized for top yields. In order to provide more organic matter, a cover crop of wheat or rye is planted in the winter before planting the strawberries. Strawberries prefer a pH from 5.5 to 6.5 so lime is usually not applied. The harvesting and cleaning process has not changed substantially over time. The delicate strawberries are still harvested by hand. Grading and packing often occurs in the field, rather than in a processing facility. In large operations, strawberries are cleaned by means of water streams and shaking conveyor belts. Around 200 species of pests are known to attack strawberries both directly and indirectly. These pests include slugs, moths, fruit flies, chafers, strawberry root weevils, strawberry thrips, strawberry sap beetles, strawberry crown moth, mites, aphids, and others. The caterpillars of a number of species of Lepidoptera feed on strawberry plants. The strawberry aphid, Chaetosiphon fragaefolii, is a bug species found in the United States (Arizona), Argentina and Chile. It is a vector of the strawberry mild yellow-edge virus. The amounts of pesticides required for industrial production of strawberries ( ៣០០ pound (១៤០ kg) in California per acre) have led to the strawberry leading the list of EWG's "Dirty Dozen" of pesticide-contaminated produce. Strawberry plants can fall victim to a number of diseases. The leaves may be infected by powdery mildew, leaf spot (caused by the fungus Sphaerella fragariae), leaf blight (caused by the fungus Phomopsis obscurans), and by a variety of slime molds. The crown and roots may fall victim to red stele, verticillium wilt, black root rot, and nematodes. The fruits are subject to damage from gray mold, rhizopus rot, and leather rot. To prevent root-rotting, strawberries should be planted every four to five years in a new bed, at a different site. The plants can also develop disease from temperature extremes during winter. When watering strawberries, advice has been given to water only the roots and not the leaves, as moisture on the leaves encourages growth of fungus. Although official numbers are not available, the strawberry production of China in market year 2011/12 is estimated to be 2,100,000 tons. Strawberries are popular and rewarding plants to grow in the domestic environment, be it for consumption or exhibition purposes, almost anywhere in the world. The best time to plant is in late summer or spring. Plant in full sun or dappled shade, and in somewhat sandy soil. The addition of manure and a balanced fertilizer aids strong growth. Alternatively they can be planted in pots or special planters using compost. Fibre mats placed under each plant will protect fruits from touching the ground, and will act as a weed barrier. Propagation is by runners, which can be pegged down to encourage them to take root, or cut off and placed in a new location. Established plants should be replaced every three years, or sooner if there are signs of disease. When propagating strawberries, one should avoid using the same soil or containers that were previously used for strawberry cultivation. After cultivating strawberries, rotating to another culture is advisable, because diseases that attack one species might not attack another. In addition to being consumed fresh, strawberries can be frozen, made into preserves, as well as dried and used in prepared foods, such as cereal bars. Strawberries and strawberry flavorings are a popular addition to dairy products, such as strawberry-flavored milk, strawberry ice cream, strawberry milkshakes, strawberry smoothies and strawberry yogurts. Strawberries and cream is a popular dessert during the British summer, famously consumed at the Wimbledon tennis tournament. In Sweden, strawberries are a traditional dessert served on St John's Day, also known as Midsummer's Eve. Depending on area, strawberry pie, strawberry rhubarb pie, or strawberry shortcake are also popular. In Greece, strawberries are usually sprinkled with sugar and then dipped in Metaxa, a famous brandy, and served as a dessert. In Italy, strawberries have been used for various desserts and as a popular flavoring for gelato (gelato alla fragola). In the Philippines, strawberries are also popular, in which it is used for making the syrup in taho. Strawberry pigment extract can be used as a natural acid/base indicator due to the different color of the conjugate acid and conjugate base of the pigment. Furaneol is an important component of the fragrance of strawberries. As strawberry flavor and fragrance are popular characteristics for consumers, they are used widely in a variety of manufacturing, including foods, beverages, confections, perfumes and cosmetics. Sweetness, fragrance and complex flavor are favorable attributes. In plant breeding and farming, emphasis is placed on sugars, acids, and volatile compounds, which improve the taste and fragrance of a ripe strawberry. Esters, terpenes, and furans are chemical compounds having the strongest relationships to strawberry flavor and fragrance, with a total of 31 volatile compounds significantly correlated to favorable flavor and fragrance. One serving (100 g; see Table) of strawberries contains approximately 33 kilocalories, is an excellent source of vitamin C, a good source of manganese, and provides several other vitamins and dietary minerals in lesser amounts. Strawberries contain a modest amount of essential unsaturated fatty acids in the achene (seed) oil. Few studies have directly examined the effects of eating strawberries on human health. However, limited research indicates that strawberry consumption may be associated with a decreased cardiovascular disease risk and that phytochemicals present in strawberries have anti-inflammatory or anticancer properties in laboratory studies. Epidemiological studies have associated strawberry consumption with lower rates of hypertension, inflammation, cancer, and death from cardiovascular diseases. Certain studies have suggested that strawberry consumption may have beneficial effects in humans such as lowering blood LDL cholesterol levels, total cholesterol, reducing the oxidation of LDL cholesterol, and decreasing the spike in blood sugar after high sugar meals and the spike in blood cholesterol seen after high-fat meals. Garden strawberries contain the dimeric ellagitannin agrimoniin which is an isomer of sanguiin H-6. Other polyphenols present include flavonoids, such as anthocyanins, flavanols, flavonols and phenolic acids, such as hydroxybenzoic acid and hydroxycinnamic acid. Strawberries contain fisetin and possess higher levels of this flavonoid than other fruits. Although achenes comprise only about 1% of total fresh weight of a strawberry, they contribute 11% of the fruit's total polyphenols, which, in achenes, include ellagic acid, ellagic acid glycosides, and ellagitannins. Pelargonidin-3-glucoside is the major anthocyanin in strawberries and cyanidin-3-glucoside is found in smaller proportions. Although glucose seems to be the most common substituting sugar in strawberry anthocyanins, rutinose, arabinose, and rhamnose conjugates have been found in some strawberry cultivars. Purple minor pigments consisting of dimeric anthocyanins (flavanol-anthocyanin adducts : catechin(4α→8)pelargonidin 3-O-β-glucopyranoside, epicatechin(4α→8)pelargonidin 3-O-β-glucopyranoside, afzelechin(4α→8)pelargonidin 3-O-β-glucopyranoside and epiafzelechin(4α→8)pelargonidin 3-O-β-glucopyranoside) can also be found in strawberries. Modern strawberries have complex octaploid genetics (8 sets of chromosomes), a trait favoring DNA extractions. Strawberries have been sequenced to display 7,096 genes. Strawberries suffer from severe inbreeding depression, and most cultivars are highly heterozygous. Some people experience an anaphylactoid reaction to eating strawberries. The most common form of this reaction is oral allergy syndrome, but symptoms may also mimic hay fever or include dermatitis or hives, and, in severe cases, may cause breathing problems. Proteomic studies indicate that the allergen may be tied to a protein for the red anthocyanin biosynthesis expressed in strawberry ripening, named Fra a1 (Fragaria allergen1). Homologous proteins are found in birch pollen and apple, suggesting that people may develop cross-reactivity to all three species. 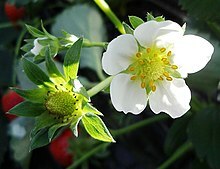 White-fruited strawberry cultivars, lacking Fra a1, may be an option for strawberry allergy sufferers. Since they lack a protein necessary for normal ripening by anthocyanin synthesis of red pigments, they do not turn the mature berries of other cultivars red. They ripen but remain white, pale yellow or “golden”, appearing like immature berries; this also has the advantage of making them less attractive to birds. A virtually allergen-free cultivar named ‘Sofar’ is available. ↑ ៤,០ ៤,១ Esau, K. (1977). Anatomy of seed plants. John Wiley and Sons, New York. ISBN 0-471-24520-8. ↑ Fletcher, Stevenson Whitcomb (1917) Strawberry Growing, The Macmillan Co., New York, p. 127. Khanizadeh, S. and J. DeEll. 2005. "Our Strawberries/ Les Fraisiers de Chez Nous ", A Description of Over 170 Strawberry Cultivars along with Regional Evaluation and Details Information Used for Plant Breeder’s Right Office. PWGSC, Publishing and Depository Services, Ottawa, Ont. ISBN 0-660-62338-2. Thurber (1879). "Strawberry". The American Cyclopædia. "Strawberry". Encyclopædia Britannica (11th រ.រ.). 1911.